We have only a finite amount of ad space available so this offer may not be around long, it is a very good value. Why advertise in the Abbott Program? 1) Abbott Programs are collectible and your ad will become a part of history. 4) All our past programs are available at MagicGetTogether.com year round. 5) Advertising is a Tax Deductible expense in most cases. 6) Abbott Program Ads need not be ads, maybe a tribute to a friend, maybe a memorial, or a gift to an unsuspecting spouse not to be seen till they are seated in the auditorium awaiting a show. So many times I am asked by visitors and magicians how they would like to know how to get their ads in the Get Together Program. Trouble is, they ask this after the Get Together and I usually forget to pass the info out to people 10 months later. This year is different and we are letting everyone know that if you want your ad in the 82nd Anniversary Program and have questions, now is the time to ask. Abbotts Fan Package - 1/4 page in AMGT program, website listing and link, 1 free ticket to thje Wednesday evening show. Amateur Package - 1/2 page in AMGT program, website listing and link, 2 free tickets to the Wednesday evening show. Abbotts Apprentice Package - 1/2 page in AMGT program, website listing and link, 3 free tickets to the Wednesday and Thursday evening shows. 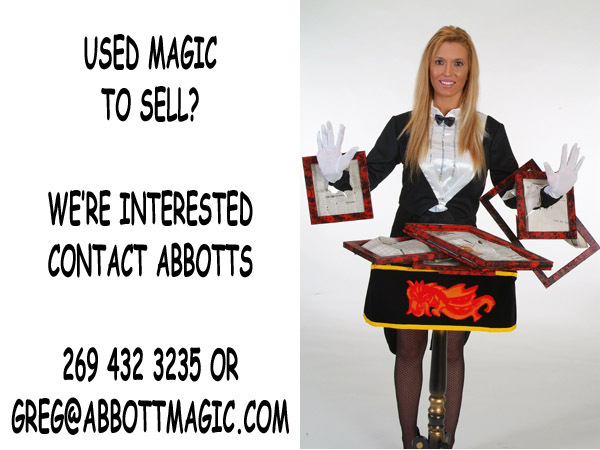 Abbotts Magician Package - Full page in AMGT program, website listing and link, Promotion on Social Media, Logo featured on sandwich boards around town, 10 free ticket to the Thursday evening show. Information needs to be in by the 5th of July 2019 (via email, snailmail, etc), call us at 269 432 3235 for more information. jpg,gif,bmp,pdf,png,doc formats will work and we can also scan your data if you get it to us before July 5th.